Highcliffe School Smart Resource Fair 2018. What better way to end the summer term than with a fair? 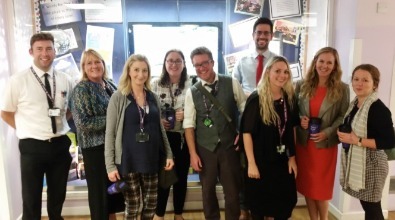 Two weeks before breaking up for the summer, we had our final Learning and Teaching group meeting of the year and decided to use it as an opportunity to share and celebrate some of the fantastic initiatives going on across the school. 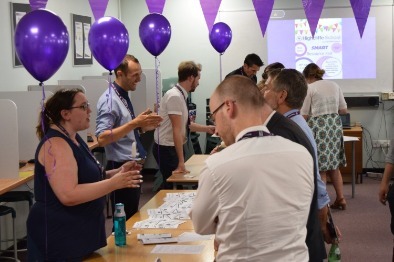 The idea was to allow staff to either present or collect a variety of new �smart� resources ready for the new term and to allow professionals to discuss effective and efficient teaching methods. So, what is a smart resource? A smart resource is a resource that supports learning in multiple contexts. Once created, it requires little in terms of planning and preparation. A SMART resource can be an object (e.g. questioning dice, question balloon), a paper resource (question matrix), an electronic resource (a slide of a PPT) or simply an easy idea! For the resource to be �SMART� ideally, it will be able to be used across many different subject areas and should require minimum planning. On the face of it, these could look like fads or �quick wins� but in fact these can the workhorses of many classrooms. We want to move away from the idea that outstanding lessons involve huge amounts of resource making like card sorts. The idea behind a smart resource is that they reduce teacher workload while still delivering an active and engaging lesson. The best thing about them? They have been tried and tested already by colleagues who are ready and willing to share what they do, and most importantly, why they work. The best people to present smart resources are the ones who use them regularly in their practice. We asked 16 members of staff from across the school in different departments and at different levels of teaching, to share the resources that they use most frequently and effectively in the classroom. They set up a �stall� in which they presented their resource or idea to small groups of other teachers and open up a discussion about how it could be made relevant and transferable to different contexts. We also used signup sheets so that resources could easily be shared and adapted as needed. To give staff the opportunity to discuss the resources collected we also set up a �discussion hub� so that ideas could be unpacked in small groups. It was good to see members of different departments discussing the same resource and how it could be made relevant to both. There were also numerous departmental conversations discussing ways to implement these ideas into current schemes of work or individual lessons. CAP stands for �Consider all Possibilities� and is a questioning activity in which students contemplate all possible outcomes or situations for the stimulus in front of them. This can be used with a questioning matrix to aid students in structuring their questions and increasing the level of higher order thinking required to both construct and answer the question. The Check it Man is used initially teacher led and then more independently by students to check their work prior to handing it in. 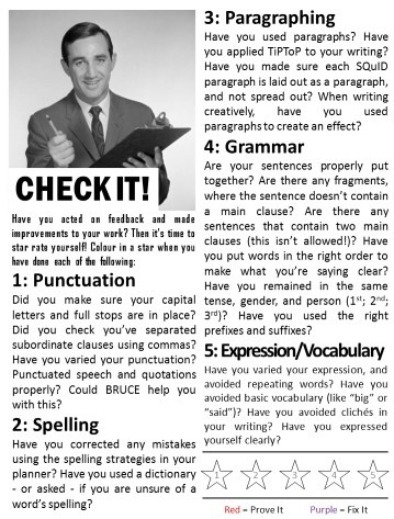 In our English dept they keep a folder of small Check it Man pages (A6) for students to collect and to stick in their book in order to show the teacher they have checked their literacy against the basic criteria prior to deep marking. 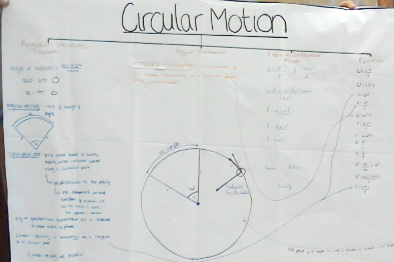 Allows for students to make visual connections to key concepts as part of a module. Our main aim was to give time back to staff and open up discussions about what works successfully. These cross-discipline conversations can be an invaluable way to connect with colleagues and we wanted to give space to that. We also wanted to refresh staff�s resources by equipping them with new ideas, not from the �top down� but at a grassroots level. The Smart resource fair was not just beneficial to the staff circulating and �attending� the fair though. Staff peddling their smart resource were able to reflect on the success of their ideas and make cross-curricular connections.